Are you looking for the best DSLR camera between Rs 30000 to 40000? But confused to choose which one is best? I’m sure! You will get the perfect one!! Even, If this is your first purchase, then it can seem scary. There are many different options available; it can be confusing to choose the right one. That is why I have created a list of Best DSLR Cameras for you under your budget. As I said that there are many cameras available under Rs.40000. But here I have listed Top 6 Best DSLR cameras out of there. So, after researching online as well as offline, I have shortlisted top 6 Best cameras for you. I have spent almost a day to make this list. There is no one who does not love a well-captured photograph. To capture amazing pictures, the primary equipment you need is a camera. There is a wide range of cameras available these days. I will help you to learn everything you need to know about how to buy a dslr camera and how to make the best choice so that you can buy that fancy camera you have always dreamed of. Without further delay, let us dive deeper into the world of DSLRs. Now, I will talk about six Best DSLR cameras in particular, that I have shortlisted. I will talk about them in detail like why these are best and their specifications, features etc. This will narrow down your search, for you to make the perfect decision. So, let us start. With these DSLRs, You will get 18-55mm, 55-200mm, 55-250mm, 70-300mm lens. In the case of DSLRs, there are many different kinds of high-quality lenses available in the market, which one have numerous options for variety and creativity in photography. Whether you are a serious photographer or a want a touch of style in your life, DSLRs are the best option out there. But for the beginner, these lenses are enough to start. Our first pick is Nikon D5300. Nikon D5300 is the best Nikon DSLR camera under 40000 Rs. This one has a good feature which gives you amazing experience while taking a photo or shoots a video. There are many reasons why I love this camera. Nikon is the second largest brand in the market of DSLR cameras, after Canon. 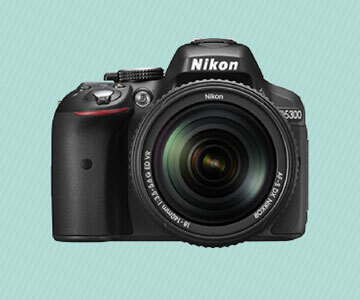 They launched their Nikon D5300 DSLR camera on October 17, 2013. Now, let me talk about its main features. Also, why I love Nikon D5300 and it’s pros cons. The Nikon D5300 has a broad range of features. It features an Expeed 4 processor with lower power consumption. This leads to an extended battery life to 600 shots. Nikon also achieved a 3.2inch (81mm) articulated high-resolution LCD screen. The HDMI HD video output is excellent. With this camera’s enhanced built-in RAW processing with extended Retouch menu, you do not need a computer for image processing. D5300 gives you full HD video in 1080p with Autofocus also in the uncompressed video(clean HDMI at 60p, 30p, 24p only) format. This is Nikon’s first DSLR with the 60p/50p frame rate at full HD resolution. One of the major plus points of this DSLR is the 24.2-megapixel high-resolution sensor without the optical low-pass filter. It gives an excellent image quality and resolution. It does not feature an Anti-aliasing(AA) filter, giving you even better resolution. The higher ISO gives you amazing performance even in low light conditions. The EN-EL14 or EN-EL14A Lithium-ion battery makes sure you get the most out of the camera. The DSLR has nine special effects, allowing you to get creative with your images. It features Active D-Lighting( four level and auto). It also features Bracketing(exposure, active D-Lighting and white-balance). The Nikon D5300 is an F-mount DSLR consisting a new carbon-fiber-reinforced polymer body and many other new technologies. With this DSLR, you do not have worry so much about cleaning the lens. It has a built-in sensor cleaning system(vibrating low-pass filter) and airflow control system. So, the camera practically cleans itself. Nikon can also boast of the D5300 being their first DSLR with built-in Wi-Fi. With this feature, you can upload your photos to the social media almost instantly. This is the first DSLR from Nikon with built-in GPS for geotagging. This comes in very handy when you are on tour, and want to mention all those places you never been to. The D5300 automatically corrects lateral chromatic aberration for JPEG files, giving you less blur in the images. The correction data is additionally stored in RAW-files and are used by Nikon Capture NX, View NX and some other RAW tools. The new pentamirror with 0.82x magnification and frame coverage helps you to capture images that are far away without moving yourself. The D5300 contains a stereo microphone input with built-in mic. It has the same 24-megapixel image sensor as its predecessor D5200 but without an anti-aliasing(AA) filter, equal to the Nikon D7100. It comes with an 18-140mm f/3.5-5.6 kit lens. From this list, this is the camera that I recommend most. After all these features, Nikon still managed to make D5300 slightly smaller and lighter than its predecessor D5200. This truly is a brilliant DSLR from the guys over at NIkon. Canon EOS 700D is another and one of the most popular best DSLR camera under 40000 Rs. 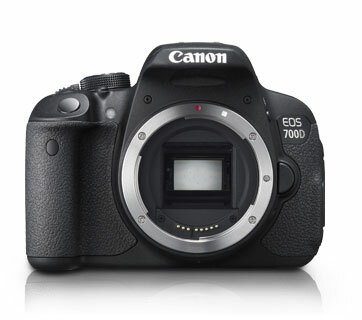 The biggest brand in the DSLR market, Canon launched their EOS 700D on March 21, 2013. 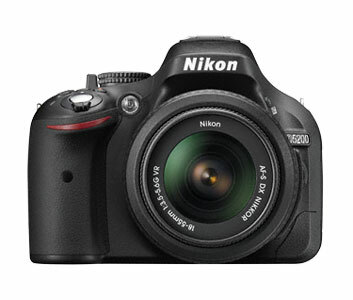 It is the successor to the EOS 650D. It is an 18.0 megapixels DSLR weighing 525grams. The EOS 700D offers an amazing performance that is among the best in entry level DSLR with its fantastic image quality, numerous functions of Live View AF and movie shooting. 700D has a DIGIC 5 image processor along with 14-bit processing. It contains Vari-angle Clear View LCD II with capacitive touch screen capabilities. The DSLR also has the new 360 degrees rotatable mode design and creative filters which allow expanding your inspiration and creative expression. The 700D boasts a 3.0-inch Vari-angle Clear View LCD II touch screen. The LCD screen provides you with clear images. The screen has the 1.04-megapixel resolution. It has a 95% viewfinder frame coverage, with magnification up to 0.85x. This allows you to capture images in a broader range. The feature set of 700D is almost identical to its predecessor 650D. However, The 700D is introduced with a new kit lens, a new version of the existing EF-S 18-55mm. This lens employs Canon’s STM(stepping motor) technology. It has a front section that does not rotate, for the first time in a Canon 18-55mm lens. The device has improved autofocus with a 9-point, all cross-type AF systems at f/5.6. The center position is high precision, with dual cross-type at f/2.8 or faster. The EOS 700D is designed with AF features that give you speedy, precise and continuous AF every single time. Canon has included continuous shooting mode in this DSLR, with 5.0 frames per second. This feature lets you take successive photos of objects. It is helpful when you want to capture a sequence of events, like in Sports photography. The DSLR features an extended ISO range of ISO 100-12800( even expandable up to 25600 in H mode). It helps you to shoot in low light situations, without using the flash. The EOS 700D can record full HD videos in 1080p at 30fps, 25p and 30p. It can also record 720p HD video at 60p and 50p. Also, the camera can record 480p ED video at 30p and 25p. ED videos are better than Standard Definition(SD) videos. However, they are not as detailed as High Definition(HD) videos. 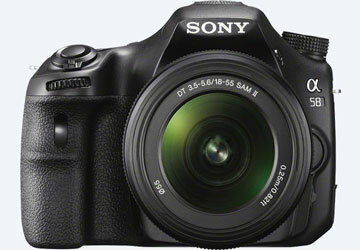 Sony Alpha A58 is the 3rd best DSLR camera under 40000 which you can buy right now. Sony is catching up in the race of DSLR market real fast. They are now a leading brand of DSLRs after Canon and Nikon. With the introduction of their SLT-A58 model in 2013, they took a big leap in the game. The SLT-A58 is a mid-range Digital single-lens reflex camera from Sony’s Alpha SLT camera line. The SLT-A58 received a very good response from both the critics and its users. The DSLR comes with an APS HD CMOS sensor along with 20.1 MP resolution. The image processing engine is extremely powerful. It consists of dual noise reduction, making low-noise images with rich tones possible. The camera is available with 18-55mm and 55-200mm lenses. It is compatible with all types of Sony A lenses. Although, Sony E lenses are not compatible with this device. It comes with a compact, lightweight and easy-to-use zoom lens. This lets you take every shot you want to, from wide-angle 18mm to standard 55mm. All type A lenses from Sony and Carl Zeiss is compatible with the DSLR. This enables you with endless possibilities in capturing images. The device has an ISO range of 100-16000. This allows you to get every little detail even in low light conditions. The masterstroke of Sony is to introduce Translucent Mirror technology in SLT-A58. This is feature not likely present in a DSLR. In this technology, there is no moving mirror. So, the camera captures the scene super fast, exactly as you would like to. SLT-A58 is equipped with 15-point AF system with 3 cross sensors. It also has a full-time continuous AF feature. The camera lets you keep shots and videos in focus all the time. In addition, the AF system has a lock-on function tracking moving objects and keeping them in sharp focus. This feature is particularly helpful for sports and wildlife photography. The SLT-A58 features ‘Burst shooting mode’, capturing up to 8 frames per second with continuous autofocus. It helps you to take shots of fast-moving action with ease, so every single frame is crisp and clear. This feature is really useful in sport and wildlife photography. Sony has put a high contrast OLED Tru-finder in the DSLR. This precisely shows you images as they will appear. This makes it easier for you to edit them, such as exposure adjustment and factoring in any settings. The intelligent Auto and Superior Auto settings analyze the image and shooting conditions. They also adjust necessary settings for best results, making it easier for you to take fantastic pictures. Another excellent feature of this DSLR is Auto Object Framing that automatically detects what you are shooting. The feature also crops borders in order to create tighter and pro-style compositions. The camera records Full HD videos. Along with that, it has rapid phase detection tracking autofocus, allowing you to keep even fast-moving objects in clear focus. The videos recorded in this device are recorded in either AVCHD 1080i or MP4 format. These formats are ideal for sharing in social media such as Facebook and YouTube. Sony introduced the panorama feature in the DSLR. You just need to press the shutter and sweep the camera. It ensures extra-wide panoramic images. With the device’s HDMI output helps you to enjoy photos and videos in a superior quality on your HD TV. It boasts of a Face Detection software that recognizes up to 8 faces in a scene. The camera itself optimizes exposure, white balance, flash and other required settings for the portrait. As a result, you do not need to worry about editing. The device has 15 creative effects including retro, toy camera, partial color, posterization etc. This helps to stylize your images. The SLT-A58 is also a thinking machine on its own. With its handheld Twilight mode, it is able to take six pictures in quick succession. It then takes the best portions from each one to create a unique and exceptional composite shot. The SLT-A58 also supports Capture One Express(for Sony). Capture One Express(for Sony) is one of the best RAW converters, rendering precise colours and incredible detailing. It contains all the essential adjustment tools with an exceptional performance that is both fast and trustworthy. With all these features, the Sony SLT-A58 truly is a masterpiece. Nikon launched their new DSLR D3400 on August 17, 2016. It is a best mid range dslr camera in india. This is a 24.2 MP DX format DSLR Nikon F-mount camera. It is an entry-level DSLR for beginners and experienced DSLR hobbyists. The camera is the successor of the Nikon D3300. It has some of the features of D3300. However, Nikon has changed some of the features of the old DSLR and replaced them with new ones. 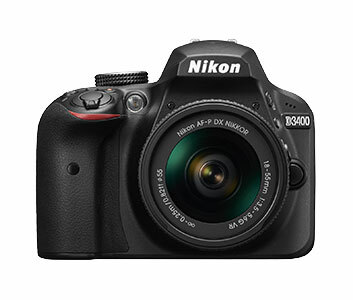 The D3400 received brilliant responses from its users, making it a very successful product from Nikon. The Nikon D3400 is equipped with excellent features. Nikon D3400 runs on Expeed 4 processor. The processor gives you fast and smooth performance. The DSLR has a 24.2MP megapixel sensor. Nikon has not included an optical low-pass filter. This gives you less blur in the images. The device has an ISO range of 100-25600, allowing you to take flawless photos even in low-light conditions. The game changer of this DSLR is the ‘Guide Mode’ introduced by Nikon. The camera teaches you how to handle it with ease with step-by-step instruction, right at the moment. In the ‘Automatic Mode’, the camera decides for himself the settings required for amazing outcomes. One of best features of Nikon cameras are the autofocus systems. The D3400 is not an exception. It quickly recognizes your subject and gives accurate focus, even in high-speed shooting and low-light conditions. In this camera, Nikon provides six preset picture controls. They increase the color and tone of your images. The device also has customized selections for your style. The DSLR can capture five frames per second with full autofocus continuously. All you need to do is press and hold the shutter button. So, now make an enthralling photo sequence whenever you want. The D3400 can record 1080/60p Full HD videos. It will be available with an AF-P 18-55mm kit lens. This will also include Nikon’s version of optical image stabilization they call Vibration Reduction(VR). The new AF-P DX NIKKOR 18-55mm f/3.5-5.6G VR lens from Nikon uses a stepping motor to provide effortless and fast auto focusing. This allows you to record moments on your D3400 without any unwanted noise. The Nikkor lenses from Nikon are very well-crafted, and each one gives an entirely new view of the images. With the D3400 and the superb Nikkor lens, the photos and videos you capture appear vibrant and lifelike as the moment itself. Now, coming to the connectivity. Nikon has invented their connectivity system, and it is flawless. The feature is named ‘SnapBridge’. SnapBridge has opened new roads on how cameras and smartphones work together. When you take a photo in your D3400, it is automatically transferred to your compatible smartphone or tablet, enabling you to share it instantly. SnapBridge also works with ‘Nikon image Space’, a cloud storage and sharing site of Nikon. It backs up your images and helps you to create and share images with your family, friends, and with the world. This is the future of photo sharing. To use Nikon SnapBridge, all you need to do is install the app on a compatible smart device. The optical viewfinder lets you have a fine and glare-free view. The device’s grip is so comfortable that enables accurate handling. The DSLR is very lightweight that you will love to take it with you everytime you go out. The camera’s controls are so easy that you can handle it like a pro for the first time. Nikon announced this camera on November 6, 2012 for the most of the world. They launched it on January 7, 2013 for the North American market. The D5200 is an F-mount DSLR camera with a newly developed 24.1-megapixel DX-format CMOS image sensor. This camera is the successor of the D5100 and the predecessor of the D5300. Toshiba makes the sensor of this device. The DSLR runs on Nikon Expeed 3 image/video processor. It comes with AF-S 18-55mm VRII kit lens and AF-S 18-140mm VR kit lens. The kit also includes a 16GB Class 10 SD Card and a carrying case. The Nikon D5200 has various unique features. The Expeed 3 image/video processor serves as the core of the D5200. It is equipped with a 24.1-megapixel DX-format sensor, giving you gorgeous images. Toshiba makes this sensor. With an ISO range of 100-6400, it lets you have amazing pictures even in low-light conditions. The ISO range is expandable up to 25600. The DSLR comes with the best in its class 39-point AF system, giving you brilliant focus and superb image quality. Nikon has packed its Scene Recognition system in this DSLR, which is same as the 2016-pixel RGB sensor. It gives you precise scene brightness and color. With this camera, you will always click excellent photos, even if you are an amateur in the world of DSLRs. The AF system also has advanced tracking and intelligent face detection. The camera allows you to take exceptional portraits, and amazing background blurs and superb action shots. The DSLR’s new large LCD screen with high resolution can flip out and swivel to almost any angle. This gives you ultimate flexibility. In turn, you get the perfect frame in low angles, populated places and so on. Nikon has introduced ‘Live View’ feature in the D5200. When in ‘Live View’, you get the same image as you see it on the LCD monitor. You can easily take any shots in almost no time. The D5200 records Full HD videos in many different frame rates. It gives you exceptional clarity. The autofocus keeps even the moving objects in the frame. The camera captures sound in stereo with its built-in microphone to give you even better performance. Now you can control your device from up to 20 meters away with ease. The optional Wireless Remote Controller will do this job for you, which is better than infrared controllers. Just connect the WR-R10 transceiver to the camera and control your DSLR with it. The device is compatible with a vast range of NIKKOR lenses, ranging from wide-angle lenses to zoom lenses and then some more. You can now add yourself to every photo with the optional WU-1a Wireless Mobile Adapter. Just connect it, and you can control the DSLR with your Android or iOS device. Also, you can connect the GP-1 GPS Unit to add a location. In this way, you will never forget where your special moments took place. With all these features, the things you can do with your camera are a never-ending list. The Canon EOS 1300D was launched on March 10, 2016. It is known as ‘Rebel T6’ in the USA and as ‘Kiss X80’ in Japan. The DSLR is an entry-level DSLR that supersedes the EOS 1200D. A key added feature of this device is the newly added Wi-Fi. This is a best canon dslr under 30000. So if you want to buy a DSLR Camera from Canon then this is a best for you. The EOS 1300D is made up of Carbon fiber and polycarbonate resin. It has a weight of approximately 485 g (body only), including battery and memory card. The Canon EOS 1300D has some amazing features. Let me tell about it. The DSLR has an 18.0 effective megapixel APS-C CMOS sensor. This gives you excellent picture quality and resolution. The device runs on DIGIC 4+ processor, giving you quick and smooth performance all the time. This is a distinctive change from its predecessor 1200D, which runs on DIGIC 4 processor. It has 3.0 inches TFT LCD screen with 4:3 ratio color. This gives amazing clarity in the pictures and great colors. The LCD screen has 920.000 dots resolution when the older 1200D had only 460.000 dots with the same aspect ratio. This gives you better images than the 1200D. The device has 95% viewfinder frame coverage, along with 0.80x magnification. This allows you to cover more area in your images and videos. You can take pictures of far away objects without moving yourself. The EF and EF-S lenses are compatible with this Canon EOS 1300D. The focal length is equivalent to the 1.6x the focal length of the lens. The AF system gets locked when you press the shutter half way in One Shot AF mode. It has an Auto white balance feature added with the imaging sensor. The DSLR has a built-in fixed low-pass filter. The DSLR has its cleaning system with manual cleaning and Dust Delete Data acquisition. The device has a built-in flash. The flash coverage is up to 17mm focal length. It is also equipped with ‘Near-field connectivity(NFC) for transfer of data to devices such as computers and smartphones. As a newly added feature in Canon, this DSLR has built-in Wi-Fi. It lets you connect to the internet and share your photos on social media almost instantly. Sony has also introduced ‘Near Field Connectivity(NFC) in the EOS 1300D, which was not present in the 1200D. The ISO sensitivity of the EOS 1300D ranges from 100-6400, which can be expanded to 12800 when in H mode. The camera can record 1080p Full HD videos at 24p, 25p, and 30p, giving you fantastic picture quality. In addition, it also records 480p ED videos at 30p and 25p. The 9 AF points with 1 cross-type point in the center at f/5.6, makes sure your images always stay on focus. The autofocus also has extra sensitivity at f/2.8 or faster. However, this feature does not work when an EF-28-80mm2.8-4L USM lens or EF 50mm f/2.5Compact Macro lens is attached. In ‘Continuous Shooting Mode’, the EOS 1300D captures three frames per second. It allows you to create beautiful photo sequences with ease. This feature is specifically useful in Sport and wildlife photography. So these are best DSLR cameras under 40000. If you have any doubt then feel free to ask me via comments section below. Nice article thanks. very helpful for me. Nice comparison. good post keep it up. Sony Alph a-58 & Canon 700D, Which is the best for Shooting Outdoor Videos. It really helps me to buy a new one. 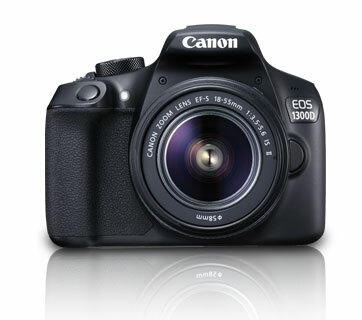 what about Cannon 1300D ? is it worthful to buy ? Which one is best for YouTube videos.